wreckage was gone over and victims drawn forth. Mrs. Floyd W. Van Sickle, of 70 Cherry st., was one of the first to be removed from the debris. She was alive and was taken to one of the booths on the ground where she was joined by her husband, who had not made the trip. Her death followed as she was being rushed to the City Hospital. Another victim of the crash, Mrs. Agnes Kurth, was a friend of Mrs. Sickle and had accompanied her on the flight that ended so disastrously. Mrs. Kurth sustaining a broken leg and arm and sprained back. The Van Sickle and Kurth families had gone to the park together in Mr. Kurth’s automobile. While Kurth and Van Sickle made a trip around, their wives had seen to the comfort of little six year old Charlotte Van Sickle, who was too timid to accompany the men. 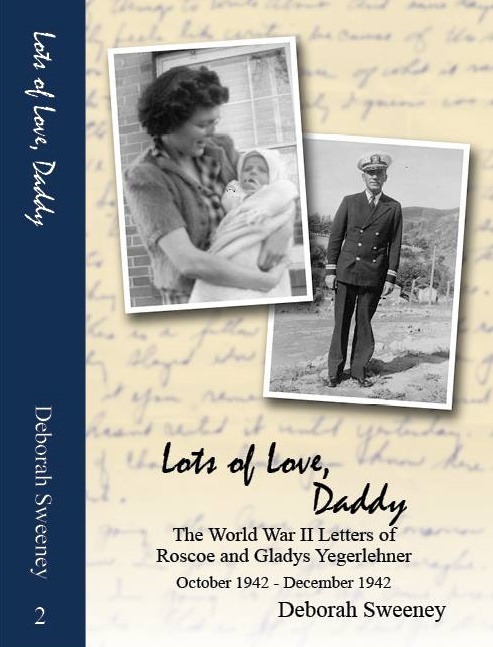 Her timidity may have saved her life later for when she still refused to go her father and his friend cared for her while their wives entered the cars and were borne aloft. 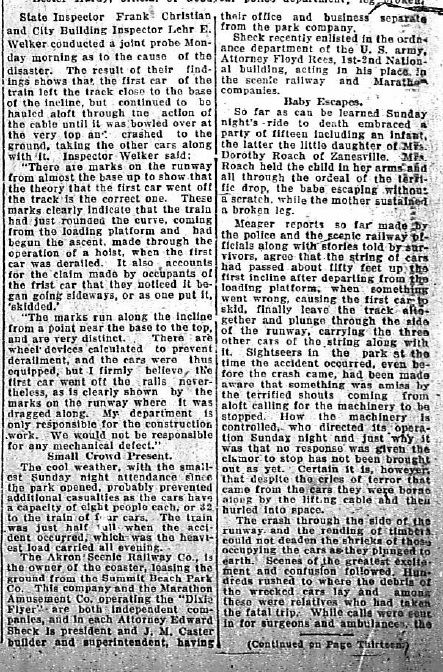 This entry was posted in 1918 Roller Coaster Accident, Newspaper Clippings, Yegerlehner and tagged Agnes (Layden) Kurth, Akron, Akron Beacon Journal, Charlotte (Van Sickle) McConnell, Erich A. Kurth, Floyd W. Van Sickle, Roberta E. (Yegerlehner) Van Sickle, Summit Beach Park on December 31, 2013 by Deborah Sweeney. The cool weather, with the smallest Sunday night attendance since the park opened, probably prevented additional casualties as the cars have a capacity of eight people each, or 32, to the train of four cars. The train was just half full when the accident occurred, which was the heaviest load carried all evening. their office and business separate from the park company. Sheck recently enlisted in the ordinance department of the U. S. army, Attorney Floyd Rees, 1st-2nd National building, acting in his place in the scenic railway and Marathon companies. So far as can be learned Sunday night’s ride to death embraced a party of fifteen including an infant, the latter the little daughter of Mrs. Dorothy Roach of Zanesville. Mrs. Roach held the child in her arms and all through the ordeal of the terrific drop, the babe escaping without a scratch, while the mother sustained a broken leg. Meager reports so far made by the police and the scenic railway officials along with stories told by survivors, agree that the string of cars had passed about fifty feet up the first incline after departing from the loading platforms, when something went wrong, causing the first car to skid, finally leave the track altogether and plunge through the side of the runway, carrying the three other cars of the string along with it. Sightseers in the park at the time the accident occurred, even before the crash came, had been made aware that something was amiss by the terrified shouts coming from aloft calling for the machinery to be stopped. How the machinery is controlled, who directed its operation Sunday night and just why it was that no response was given the clamor to stop has not been brought out as yet. Certain it is, however that despite the cries of terror that came from the cars they were borne along by the lifting cable and then hurled into space. “Roller Coaster Accident At Summit Beach Sends Three to Death, With Others Doomed,” Akron Beacon Journal, 8 July 1918, p. 1, col. 7-8. This entry was posted in 1918 Roller Coaster Accident, Newspaper Clippings, Yegerlehner and tagged Summit Beach Park on December 30, 2013 by Deborah Sweeney. Investigation of the cause of the accident on the Summit Beach roller coaster, “Over the Top,” which caused the death of three persons Sunday evening and may result in three more fatalities, is likely to center around the responsibility for the placing of a block of wood on the left track of the incline about 10 feet from its beginning. This piece of wood about 4x6x8 inches in size was run over by the front truck of the train, derailing the wheels, which then ran on the ties and running board of the incline up to the point where the train finally crashed over the side to the ground 40 feet below carrying its human freight to death and injury below. This piece of wood was found this morning, and bore marks of the wheel flanges. That the accident will be probed from several directions is indicated today. Prosecutor Roetzel said Monday morning that he would look in the criminal responsibility of the accident. Inspectors of the city building department made a thorough inspection of the coaster today and their findings are not out of accord with the theory that the block of wood may have been the cause. Directors of the operating company are in session this afternoon and will issue a statement later as to their investigation. Mrs. Floyd W. Van Sickle, 27 years, 70 Cherry st.; taken from wreckage alive, but died on way to City hospital. Frank King, 373 Pearl st.
Clyde Keen, address unknown; City hospital. Dennis Glassford, 25, Lockport, N. Y.; Peoples hospital. Harvey Higgins, 19, 814 Yale st.; City hospital. Otis Smith, 20 Bartges st.; City hospital. Mark Sos, 269 Melville st.; City hospital. Joseph Mackey, 403 S. Second st., Barberton; City hospital. Mrs. Dorothy Roach, Zanesfille; City hospital. Mrs. John Yuhas, 503 First st., Barberton; Peoples hospital. Mrs. Agnes Kurth, 70 Cherry st.; broken leg and arm; Peoples hospital. Mrs. Helen Puhala, 481 S. Main st.; Peoples hospital. Francis Cook, 20, 1249 Fifth av. ; taken home. Lester Hardy, official of Goodyear police department; leg broken. “Roller Coaster Accident At Summit Beach Sends Three to Death, With Others Doomed,” Akron Beacon Journal, 8 July 1918, p. 1, col. 7. This entry was posted in 1918 Roller Coaster Accident, Newspaper Clippings, Yegerlehner and tagged Agnes (Layden) Kurth, Akron, Akron Beacon Journal, Harvey Higgins, Lieut. Lester Hardy, Roberta E. (Yegerlehner) Van Sickle, roller coaster accidents, Summit Beach Park on December 29, 2013 by Deborah Sweeney. We are indebted to C.C. 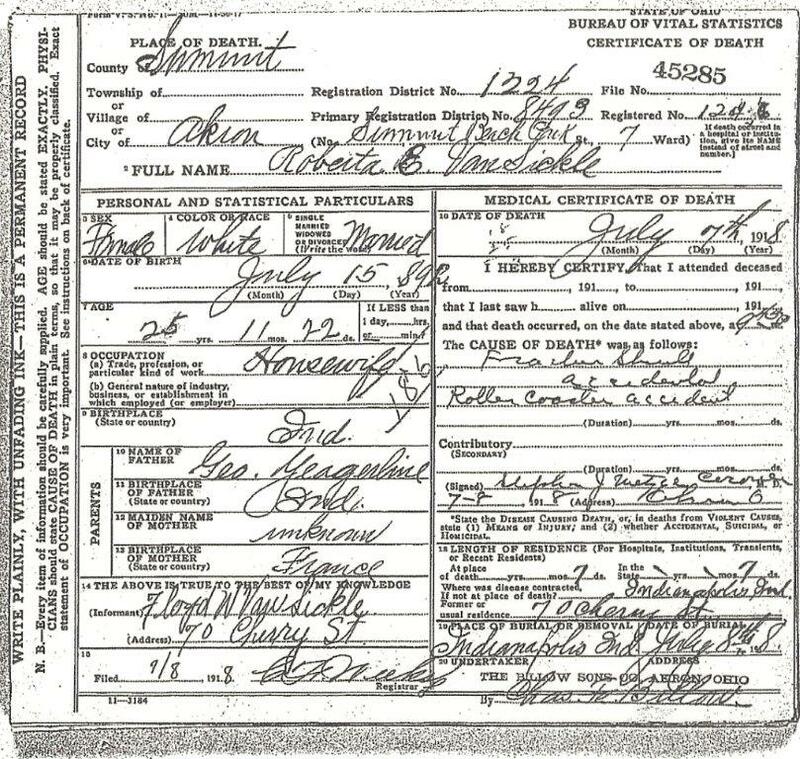 Yagerlehner for the following account of the death of his niece, who had moved to Akron, Ohio, a week before the tragic accident, which was the first serious accident that has ever occurred in the Yagerlehner family. Mrs. Robert [sic Roberta] Van Sickle was the oldest daughter of George F. Yagerlehner and was 26 years old. Mr. and Mrs. VanSickle with a party of friends were amusing themselves by making trips over a new giant roller coaster styled “Over the Top,” at Akron, Ohio. The men and the children had just finished a trip. The ladies had just started over the top on their trip and the car was plunging downward when a forward wheel broke, causing the car to leave the rail and plunge about 50 feet to the earth, killing three and fatally wounding several others. Burial was in Crown Hill cemetery, Indianapolis, Wednesday afternoon. Those from a distance attending the funeral were Grandmother Yagerlehner and Mr. and Mrs. John Yagerlehner from Clay City – Clay City News. “Death,” Brazil Weekly Democrat (Brazil, Indiana), 24 July 1918, p. 4, col. 4; digital image, Newspaper Archive (http://www.newspaperarchive.com : accessed 28 December 2013). Akron, Ohio – Three persons were killed, and three fatally injured and eight seriously hurt when a train on “Over the Top” a giant roller plunged 50 feet to the ground at the local amusement park last night. The front wheels of the first car broke while making the ascent where the thriller commences. The crowd yelled in derision as the passengers frantically called for help. An infant in its mother’s arms escaped injury. The dead and injured are: Mrs. Roberta W. Van Sickle, Ralph L. King, of Akron, and General Bailey, Tariff, W. Va. Probably fatally injured: Clyde Keen, address unknown; Otis Smith, Akron; Dennis Glassford, Rockport, N. Y.; Harvey Biggins, formerly of Athens, Ohio, was injured. The body of Mrs. Van Sickle, who recently moved here with her husband and child will be taken to the home of her parents in Indianapolis. “Three Killed When Roller Coaster Drops,” Lima Daily News (Lima, Ohio), 8 July 1918, p. 2, col. 4; digital image, Ancestry.com (http://www.ancestry.com : 28 December 2013). Photograph taken at the house of George F. Yegerlehner/Yagerline on Grace Street. Back Row: Unknown male (possibly Robert C. Yagerline), Mr. Van Sickle holding Charlotte, Mrs. Van Sickle Middle Row: Jewell (Ratcliffe) Yagerline, William O. Yagerline holding Dorothy, Floyd Van Sickle, Roberta (Yagerline) Van Sickle, George F. Yagerline Front Row: Elizabeth Louisa (Klein) Yagerline, Louis Yagerline, Hazel Yagerline, Margerite Yagerline, Laura Yagerline: Photograph from the collection of Hazel (Yagerline) Igelman in the possession of Eric Graham. 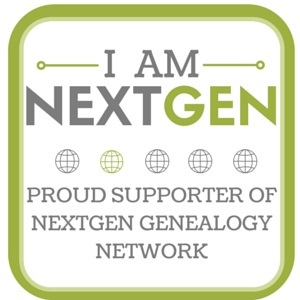 Roberta Elizabeth Yegerlehner was the oldest daughter, and second child, of George and Elizabeth (Klein) Yegerlehner. She was born 15 July 1892 in Indiana, most likely in Indianapolis. George was a blacksmith employed by the railroad, so he moved around a bit before settling permanently in Indianapolis. George and his brother Charles shared an address in Indianapolis as early as 1893. Roberta married Floyd W. Van Sickle on 17 September 1909 in Indianapolis. They had one daughter, Charlotte, who was born in 1912. Floyd was a truck driver and a mechanic. He worked with his father and brother at Vansickle and sons on Hamilton Street in Indianapolis. The reason why Floyd and Roberta moved to Akron is unknown, but the result was tragic. Roberta is buried at Crown Hill cemetery in Indianapolis with her parents. Floyd later remarried and is buried with his second wife. This entry was posted in 1918 Roller Coaster Accident, Genealogy, Sunday's Obituary, Yegerlehner and tagged Akron, Elizabeth (Klein) Yeagerline, Elizabeth (Schwartz) Yegerlehner, Floyd W. Van Sickle, genealogy, George F. Yeagerline, Indianapolis, John Henry Yegerlehner, Lovina (Schiele) Yegerlehner, Roberta E. (Yegerlehner) Van Sickle, roller coaster accidents, Sunday's Obituary, William O. Yegerlehner on December 29, 2013 by Deborah Sweeney.